Eat hot or cold. A natural source of protein for muscle growth. Great with chicken or veggies. Source of protein and fibre. Low in saturated fat. Vegetarian Society Approved. Vegan. 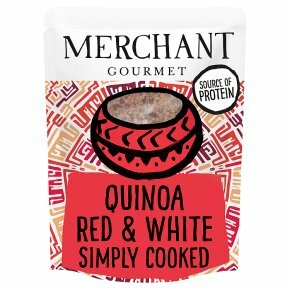 Low GI longer lasting energy compared to white rice* *Merchant Gourmet Red & White Quinoa has been scientifically tested to show it has a lower GI compared to a ready to eat white rice. Quinoa is a fantastic, healthy alternative to white rice. Our Red and White Quinoa has been simply cooked with water and a dash of olive oil, and has a wonderfully nutty flavour that works beautifully in salads. Good to know Protein contributes to a growth in muscle mass. East to prepare Squeeze the pouch to loosen the grains. For best results, heat through in a pan with a dash of water. Otherwise, tear a 2cm opening at the top and microwave for 45s at 900w, or simply enjoy it cold. Get creative For a wholesome porridge: stir the Quinoa into a pan of almond milk, berries and pistachios. Simmer over a medium heat for 8-10 mins, and serve in a bowl, drizzled with honey. Lay the unopened pack on its side and heat using the guidelines below.900 Watts, 40 (secs)750 Watts, 60 (secs)500 Watts, 120 (secs)Leave pouch for 30 seconds then shake well before opening away from yourself to avoid steam. Bring half a pan of water to the boil and place the pouch unopened in the boiling water. Simmer for 10 minutes, then tear open and serve.